Northern R&D acts as a center of research and development (R&D) of agricultural production in the northern region – the outcome of consolidation of the local R&D centers in the north. Northen R&D directs, coordinates and conducts applied agricultural research and development in northern Israel. Northern R&D is the largest peripheral regional R&D; its size and the number of researchers it employs allow operational flexibility and provision of high-quality solutions for the needs of the entire northern region. 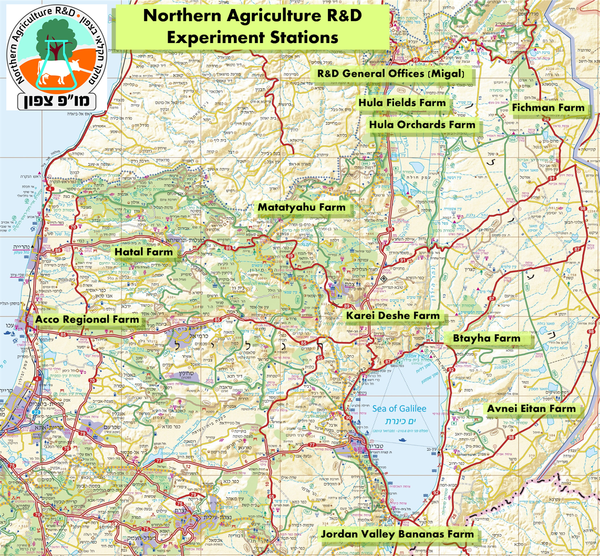 Regions of activity: the R&D operates throughout the Upper Galilee region of the Ministry of Agriculture and in addition is responsible for the Jordan Valley region (and part of Beit She’an) – a total of 12 regional and local agricultural councils with more than NIS 6 billion in fresh agricultural produce per year. This region is characterized by a broad range of topo-climatic sub-regions (crops at 1100 m above sea level and crops at 250 m below sea level) with variable soil conditions and similarly large differences in water quality and availability. This huge range requires work and an ability to respond to a large number of agricultural crops and promote additional market-adapted branches, developing and expanding them while competing and creating a competitive market advantage. The work focus is derived from understanding market needs and assessing the situation relative to expected trends in agriculture, wherein we deal with a range of requirements mainly with respect to environmentally-friendly produce and improving freshwater-use efficiency. Likewise, we are required to maintain and develop sustainable agriculture (environmentally-friendly crop management) in a region where intensive agriculture, open landscapes, tourism, water sources and a rural population exist side-by-side. Northern R&D operates through 10 stations or research centers spread throughout the north; each one is characterized by unique topo-climatic and growing conditions. Nevertheless, about 70% of the activity is conducted in the growers’ fields.